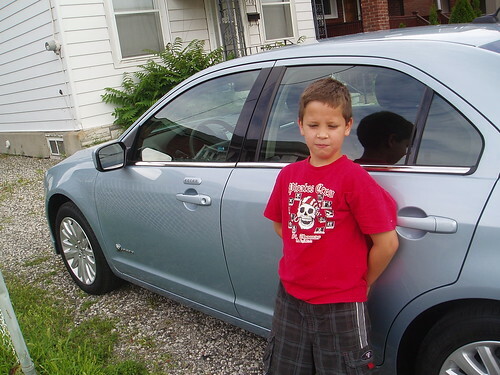 I just returned the the 2010 Ford Fusion Hybrid I've been driving for the past week. Ford gave me the car for a no-strings-attached seven days and I drove it to Lake Huron and back. I wasn't told to write a positive review or a review at all, they just told me to have fun and try and bring it back in one piece. It was a lot of fun. It drives wonderfully and has all these extras I hadn't experienced before. When something is in my blind spot, there's an indicator light on the mirror. When I reverse, a camera shows me what's behind me and there's a beep if someone or something is approaching from the right or left. 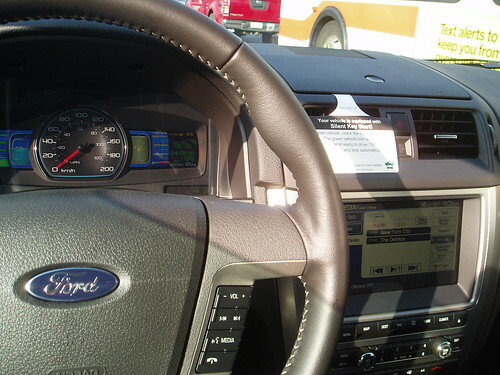 There are visual rewards for conserving energy by way of leaves that grow on the dashboard. It's pretty cool. The Fusion had Sync technology, so I hooked up my iPod Touch and my Blackberry via Bluetooth. That feature, along with the Sirius satellite radio, will be the hardest to let go. I need me a sweet sound system! The only negative to report is the lack of storage space. 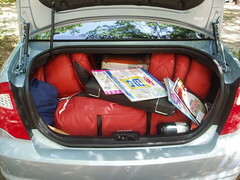 I prefer smaller cars, and I understand this is one of the sacrifices, but packing for a camping trip with two kids was quite the challenge. It's a good thing I left my wife at home. I sincerely could see myself in a Fusion Hybrid. It's my kind of car. 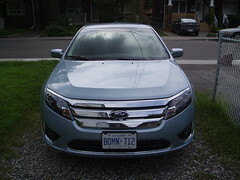 I mentioned I'm taking a 2010 Ford Fusion Hybrid for a week test drive. I picked it up this morning and drove it around town, and here are some quick initial thoughts. When you turn the ignition, there's complete silence. The only indication you've turned the car on is a little green light. It's going to take some time to get used to that. I love getting satellite radio in the car, Sirius specifically. I listened to Howard Stern interview Quentin Tarantino and quickly remembered how much I love that show. As you conserve, you see leaves growing on your dashboard. It helps make it a game. You want to conserve and make those leaves multiply. Once I found the USB port, an ordeal unto itself, I was quickly reminded how cool that Sync technology is with my iPod. Between the iPod and Sirius, I doubt I'd even listen to terrestrial radio in a car like this. When I'm reversing in the Fusion, the front panel shows me what's behind me. There's a freakin' camera mounted above the rear license plate. There are even beeps and other warnings when someone is approaching or when you're too close to that car/pole/person. It's a sweet ride. I took it on the highway and through city streets and it's been a pleasure. I'm looking forward to this road trip, I'm just sorry I have to give it back. Hey Ford, whattyasay we let this one stay with Toronto Mike?